…The hypocrisy of the shrieking anti-Jewish and anti-Israel mobs in Paris was apparent When we consider that last week, the Syrian regime dropped barrel bombs upon civilians and destroyed the Palestine hospital in Yarmouk, a southern suburb of Damascus, populated by Arabs who call themselves Palestinians. Hundreds were killed and injured. 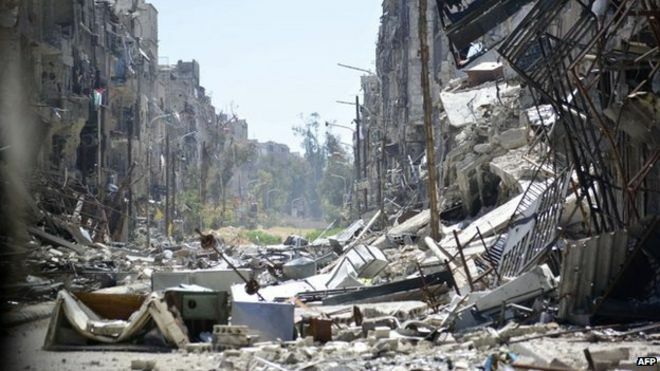 One Yarmouk resident said: “They slaughtered them in the streets.” This was not in Gaza or in any areas occupied and controlled by the Palestinian Authority. Now compare this massacre in Syria to the false stories of a “massacre in Gaza” in 2014. Hamas propagandists filled Facebook feeds with pictures of dead children, most of whom were not even in Gaza and some who were later seen getting off their stretchers and walking away. The mainstream media shamefully did not check or verify the false claims made by Hamas who cynically manipulated the foreign “reporters” who now admit their abandonment of objectivity for fear of violent reprisals by Palestinian terrorists. But the damage was done and the Jewish state was unjustly demonized. In Syria there are real massacres of Palestinians. But where are the Muslim mobs and their European useful idiots? Where are the drones chanting in the streets of Paris? Where are the thousands of tweets we saw in 2014? They don’t exist because Israel was not involved, which reveals the utter hypocrisy and malevolence behind the execrable anti-Jewish and anti-Israel campaign.